From his work in the Misfits to Samhain to his solo efforts in the eponymous Danzig, Glenn Danzig has contributed volumes upon volumes to the metal canon. Hell, his first three solo albums are back-to-back-to-back essentials -- and some of the genre's most important releases. 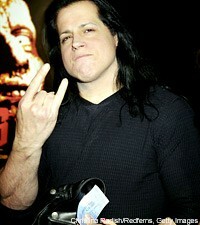 Danzig will release his first new album in six years, 'Deth Red Sabaoth,' on June 22. I chatted with Danzig himself about shooting videos, his comic book publishing house, his ride and of course, Jersey and the Misfits. I've also been listening to the album, which has a classic rock guitar sound -- but it's still anchored by Glenn's throaty roar. It's a keeper, that's for sure. We were shooting for the song 'Night Star Hell.' There's an altar in it, with blood runners etched into it. Do you know what a blood runner is? They are etched into the altar, cut into a symbol and the blood runs down the altar. It's cool imagery. It's an altar fully equipped with blood runners. Since this is your first album of new material in several years, what do the Danzig die-hards need to know? The fans, the die-hards, they already know that it's coming out, but for those who like Danzig, well, I paid a lot of attention to detail and made it contemporary sounding. It's got a '70s sound, but it's contemporary. So far everyone digs it and I did what I set out to do with it. I used old gear with custom speakers and amps, not like the ones these crappy new metal bands use. I wanted this to be an album where you play it in the car and the bass rattles your dashboard. I achieved that. When your car rattles when you drive, you know you are playing cool music. What kind of car does Glenn Danzig drive? Any muscle cars? I have an old Shelby '68 Mustang that I don't drive. I have a '97 or '98 Jag XT, it's cool looking and I keep fixing it. I dig driving it. Your Verotik publishing company recently released 'Hidden Lyrics of the Left Hand,' which collects previously unreleased Misfits, Danzig and Samhain lyrics. What was the impetus? Fans constantly bugging you for unprinted lyrics? It's all song lyrics that were not transcribed into a CD booklet at the time. Fans were always asking about these lyrics. It's not just a book. I hired one of the artists at my company to illustrate each lyric, to give fans more. I just did two in-stores for it, in Phoenix and in L.A., at the Golden Apple. There were big turnouts. It took my distribution company by surprise. In the comic world, no one gets reorders, and we've already gotten reorders for this. You're a noted comic book fan. What's your take on comic book movies like 'Iron Man' and 'The Dark Knight' selling millions in tickets, yet the source material -- the comic book medium -- remains largely underground. Comics are a dying art. If you ask a little kid to choose between a video game with insane graphics or comic books ... you have to compete with cable, satellite TV with its thousands of channels and with video games that are like movies, with CGI explosions where you can blow up worlds. Comics are printed on paper, which is expensive, making it tough to stay in business. As for the movies, the characters have been around forever and appeal to an older demographic. Parents who remember the comic can take their kid to see the movie. I have to ask since I am from New Jersey, and every time I drive in Lodi, I think of you. Do you consider yourself 'Jersey' still? I was born in New Jersey but lived there and in Boston because of my family. I associate with the East Coast. Jersey likes to claim you as one of our own. Or Jovi, even though you pre-date Bon Jovi! Since we're on the topic of the Misfits, will we ever see any more activity? No. Nope. Never. Not gonna happen. That is certainly definitive. Will you be touring anytime soon? I will play five East Coast shows in June and then four West Coast shows, probably around the week the album comes out. I don't think we're even getting a tour bus. We're just going to show up at the venues, like 'Hi. Play. Bye.' Then we'll tour again in the fall.